My good friend Drea and her husband Jarrod came to visit us two weekends ago.... while Jarrod rode bikes with Brian, Drea and I got crafty.... and decided we had to make something from our Nutella pinterest board! We had a tough time narrowing the list down to one or two items to try.... this one made the cut. These are super delicious and super easy, a good combo in my book! Here's the recipe we used. Put Chex in a large mixing bowl. In a medium, microwave safe, bowl add Nutella and butter. Microwave on high for about 30 seconds. Stir well to combine the Nutella and butter. Pour over the top of the Chex and stir gently covering all the cereal with the hot Nutella. Place in a large zip-top baggie, add sugar, zip closed, and then shake to coat cereal with sugar. This may need to be done in stages depending on the size of your bag. (I used a new large brown paper bag.) Spread out on parchment paper to cool. Enjoy! We used only Rice Chex, the recipe will consume about one normal sized box. This kept the cost low since we didn't buy three boxes of cereal! The bowl did make it easy to get the nutella-butter somewhat incorporated before transferring to a gallon Ziploc bag. 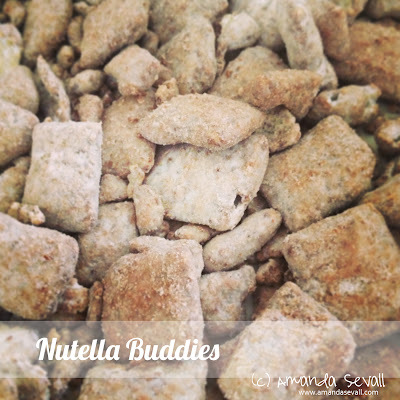 We added about 1-2 cups of cereal to the bowl at a time, then a whopping spoonful of nutella-butter and stirred. After that preliminary mix in the bowl, we then transferred all of it to a gallon Ziploc bag, closed and shook to finish mixing. We added the powdered sugar in batches. We actually used about 2-1/2 cups of powdered sugar. Drea's Helpful Tip: The key is to shake until the bag is clear and you can see through it! YUM!! We had a Nutella Strawberry crepe at Picnic Day on Saturday. It was AMAZING. Steve said it was his first time eating Nutella - not sure how that's possible!